We’ve coined the phrase ‘super user’ here and relay it to all our clients. Some of us prefer the term ‘IT champion’ though so we try to incorporate both terms to keep everyone happy. And it saves us repeating ‘super’ too often! So, whether your company is large or small, international or independent, it can be very affective for your offices to assign at least one individual as the go-to person for all technology queries and dramas. It’s all very well having your IT systems made and fitted in a way that’s tailored totally to your business, but what happens when delivery finishes and leaves you with the tools? IT support is not something that can come for free. Afterall, it’s someone’s valuable expertise that’s needed to maintain your systems and advise you as and when you need them. It’s likely to be cheaper and more time saving to train an inhouse team member as your super user. This will ensure your use of the time spent with your experts is efficient. Support and problem solving from your provider often needs lots of coordination and retained knowledge from the business it supports. This will consist of things that aren’t written down or shared such as confidential matters and general first-hand experience of the company’s workings. Without this knowledge, time can be lost – and therefore productivity. Providing the relevant knowledge or access to tools is something often built up over periods of time. It makes sense to have someone already within the business to take on the super user title to help transfer knowledge timely and effectively. Dealing with issues is both an internal job as well as external for your service providers. It can be a far better experience with an internal champion rather than just your external service providers. A third party won’t be in touch with your staff daily or individually, they’ll be focused on restoring the overall service. Therefore, your team will feel isolated in IT faults as there’s no mechanism for their experience to be managed. Your IT champ will have more of an idea of the pressures a particular person is under and can deal with them accordingly based on the activity from the external parties. Quite often, systems and applications are maintained and supported from a technical rather than consumption point of view. If you implement a piece of software, you should take reasonability for ensuring that your staff can use it productively to support the agreed business outcomes. The supplier, more often than not, is not responsible for this. But a super user or IT champion can take that vital role. This person will be able to educate employees on how to use the systems correctly and therefore efficiently to meet the needs of the business. Alternatively, it could become quite a costly failure. Sign up with us to start training your new IT super user/champion, whichever you like the sound of best! “Boundaries don’t have to mean barriers,” is one of the many clever catchphrases to describe modern-day business that our MD Mike Kapur OBE came up with during his speech at the KuKuConnect networking event held in Belvoir Castle last week. He attended the Gratham location alongside Her Grace Emma Manners, Duchess of Rutland. This was a fitting scenario for Leicester’s Lord Lieutenant to make the statement being on the border of Leicestershire. Guests came from all over the East Midlands. 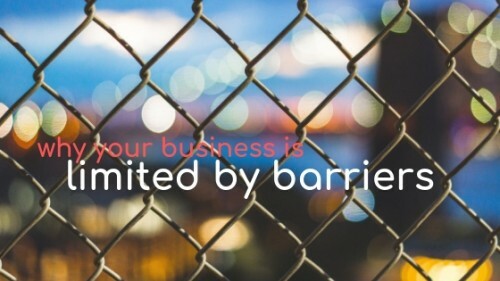 ‘Business without barriers’ is the message Mike promotes to new Leicestershire companies. He’s introduced to them by the local council to help support and advise them. His quote means this: look at the things you think of as barriers to your business and instead, see them instead as boundaries. This is a mindset that will help you think differently when challenges present themselves. For example, we’ve just begun working with Niche Magazine; Leicester’s local business and lifestyle bi-monthly publication. While the magazine’s purpose is to promote what’s going on within the boundaries of Leicestershire, they are not limited by physical barriers. They can partner up with or work alongside companies further afield. Niche is able to communicate, work with, and team with organisations across the UK – and even the world – to grow its business in other areas. And it all comes down to IT management. As an IT company we are part of the most ‘barrier-less’ industry there can be. It’s the internet, technology, and employee development that allows a company to exceed its boundaries. Companies use these things in a way that sets them aside from competitors. You may have county boundaries, office boundaries, or budget boundaries. But, with a well strategised business plan that includes budgets for IT products, services, and training, you’ll never see these as barriers again.